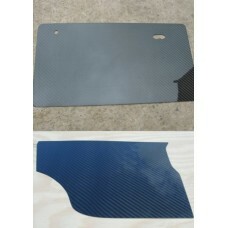 Mini Door Cards, available as a front pair, or set of four in carbon fibre (exposed weave). A great alternative to the hardboard cards as they last nearly forever! Completely waterproof. High gloss UV resistant exposed weave carbon finish, giving a high class look to any mini interior. They can be fitted using trim tape (available in our hardware section) or machine screws, or pop rivets. Velcro is also a great product that can be used. The rear cards simply pop into place, so no mounting hardware is required. 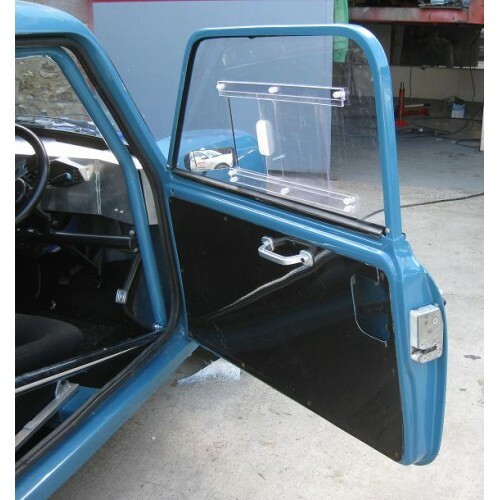 The door cards are supplied with all holes cut, so window winder, door handle, lock lever cutout and door opener hole. If you don't require certain holes in the cards, for instance if your using electric windows (no window winder hole required) please let us know via email as soon as you have ordered. Additional holes can also be added for a small additional fee. Please contact us for further information. We can also supply the door cards bare if you are planning to use different door furniture etc. (please see drop down menu). Factory Collection £free - If you are local to us and would like to collect directly from our South East Devon Factory, click 'FACTORY COLLECTION' in the 'Delivery' drop down menu. We will get in touch to let you know directions. Show Collection £Free - If you would like to save on delivery costs and pick your product up from us directly at our next trade stand instead, please select 'SHOW COLLECTION' in the 'Delivery' drop down menu. Our next Mini show can be found in the 'Next Show Dates' link at the bottom of the page. We will get in touch to confirm arrangements.